Many of our projects operate on a scale of “big,” whether that means adding huge amounts of storage space for a farmer’s crop, constructing a new residential building for storage and entertainment, or installing new equipment in a top-of-the-line seed treatment facility. One of our more recent projects may seem small in comparison, but the level of detail required was no small task. 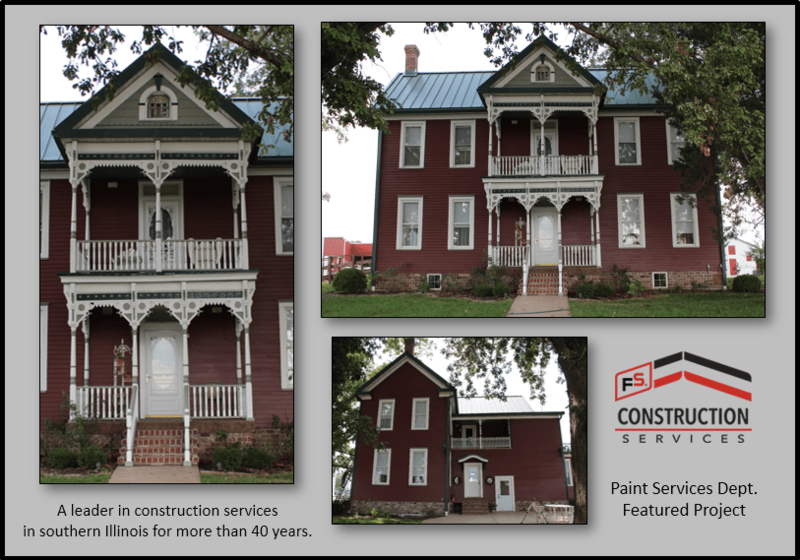 Over the past 20 years, FS Construction Services has had a wide variety of painting projects, often painting homes, barns, or bins. However, with this particular painting project, we got to work with a canvas unlike any we’d ever had before. Illinois State Representative Charlie Meiers owns a 110-year-old farmhouse that has been in his family since 1931, and it was in need of a fresh look. Over time, the house has been brown, tan, white, gray, and yellow. For Brian “Boomer” Garleb and his team, painting this historic house required an impressive amount of work. They began by power washing the entire structure with about 2,000 gallons of water. After waiting a few days for it to completely dry, Boomer and his partner Rex worked board by board, re-caulking and removing chipped or peeled paint across the whole house. Once all the old paint had been removed or, if it didn’t come off in the washing, glued in place with Peel Stop, they were able to begin painting the house. The 5,890 sq. ft. house took 23 gallons of paint and primer and a 55-ft. tall lift to be completely painted. Boomer and Rex worked by hand, which gave them the precision needed to provide this century-old house with beautiful new trim and detail work. Now, this once old farmhouse’s showcase exterior matches its rich history. Our expert paint team works inside, outside, and upside down for both residential and commercial projects, no matter the size. Meanwhile, our accurate color matching tools provide exactly the color you want. If you have any painting questions or needs, let Gateway FS Construction Services know, you can give us a call at 866-551-3454, and let our specialists help you find exactly what you are looking for. We look forward to providing you the best customer service experience.